Silly Mommy : My toe es no bueno. 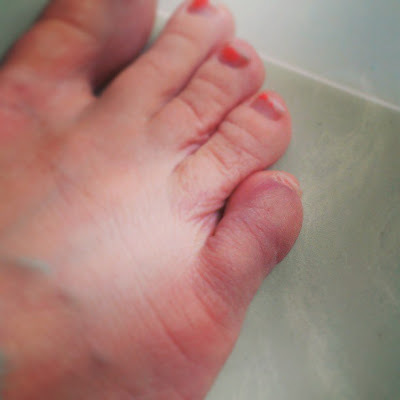 Not that you wanted to see my hideous feet, but this is what my toe looked like a day after I broke it(on beach day, walking in the sand was NOT cool). Looked even worse on Tara's wedding day! So awesome. First broken bone ever people. And it was my dang pinky toe! It hoirt. But I seriously just looked and felt like a big wimp. Purple looks good on you. Brings out the color of your flesh.